**Please note: This syllabus may be subject to revision. This version is dated December 29, 2014. Ms. Celia Pistolis, Assistant Director of Advocacy and Compliance, Legal Aid of North Carolina, Inc.
*COURSE CALENDAR: As indicated above, the course will meet on Monday afternoons from 3:10-5:10 p.m., with the following exceptions: Rev. Martin Luther King, Jr. Holiday (January 19, 2015). Monday March 30 will be an optional work session. There will be a mandatory (unless excused for good cause) course mini-retreat offsite on Saturday, January 31 (from 9:30-3:30) at the Rizzo Center in Meadowmont in Chapel Hill. Students will also be asked to arrange for office meetings with Prof. Wegner once or twice during the semester. ATTENDANCE POLICY: Attendance is required except for excused absences. Failure to attend more than one class session without being excused may lead to a grade penalty. Attendance at the retreat is required. Repeated failure to attend may lead to a decision by the professor to drop the student from the course or impose a lower grade. HONOR CODE OBLIGATIONS: The Honor Code is in effect in this class and all others at the University. I am committed to treating Honor Code violations seriously and encourage all students to become familiar with the terms of the Code set out at http://instrument.unc.edu. If you have questions, it is your responsibility to ask the instructors about the Code’s application. All written work and other projects must be submitted with a statement that you have complied with the requirements of the Honor Code in all aspects of the submitted work. COURSE MODEL: This course reflects a new model for legal education. Rather than simply focusing on helping students to learn to “think like a lawyer” (focusing on “thinking” skills, content knowledge, and very marginally on the roles and values of legal professionals) this course seeks to help students find new ways to understand the profession they will enter, develop new skills, and appreciate their personal and professional values and identities as they move toward professional careers. To that end, the course will be built according to the following models. It will introduce students in more depth to the contexts of the legal profession, help them build new “soft skills” of various sorts, and urge them to appreciate their values and personal/professional identity in order to identify their passions as they make career choices. COURSE GOALS and LEARNING OUTCOMES: This course has three principal goals, and corresponding learning outcomes, suggested by the diagrams above. What? The course will assist you in developing stronger understandings of the varied contexts in which lawyers operate – contexts that differ greatly, call upon different skills, involve different economic features and organizational structures, offer different rewards and challenges, raise different opportunities to fulfill values and different threats to values, and hence present different prospects of success and “fit” to different people. Particular developments and experiences in areas of personal interest to students: team reports and discussion leadership. How? The course will devote designated class sessions to developing skills in the designated area, and provide students with related practice opportunities. Students interested in developing skills relating to knowledge management and automated document systems are encouraged to select projects involving the “A2J” initiative (using CALI software to develop interview scripts and documents for pro se litigants in designated areas). (3) Professional identity and values. Technology (development of expertise in use of software to assist pro se litigants and, with feedback, to connect software platforms; consideration of role of technology to address gaps in access to justice). COURSE PROJECT. Each student (or in some cases teams of students) will create a course project that provides an opportunity to appreciate more fully the work of lawyers and issues relating to access to justice; and to practice key skills introduced throughout the course. As will be explained on the first day of class, we have preliminarily developed a list of potential projects, most of which involve development of a guided interview (using A2J software) that in turn generates documents needed for the user to move ahead (using HotDocs software). In some cases, projects will require students to develop other kinds of written “help” materials. In addition, students are invited to suggest alternative projects that must be approved by the instructors shortly after the beginning of the term. Alternative projects should not be traditional seminar papers, but should instead be designed in the spirit of a proposed pro bono project similar to those suggested to the class more generally, and should be designed to benefit those with limited access to legal tools, and limited resources but who nonetheless need the benefit of advice from lawyers. Project Steps and Time Line. We have broken down the steps to be taken in working through your project in order to help you learn about project planning and management and to show you the extensive feedback we plan to provide to support you through the process. • Research Memo or Prospectus Proposal Memo (10%): 2/8, 5 p.m.
• Storyboard/Outline (10%): 2/22, 5 p.m.
• Draft project submission (15%): 3/6, 5 p.m. Reflection Exercises (two) (5% each) (10% total): #1 due 1/20, 5 p.m.; #2 due 4/20, 5 p.m. Introductory Notes on Readings. Materials are posted on the course website on TWEN (see URL above). Prof. Wegner has covered copyright charges for some materials so please do not distribute them. What intellectual framework can be employed to link legal education and the legal profession? What is meant by “professional identity” and what shapes that identity? 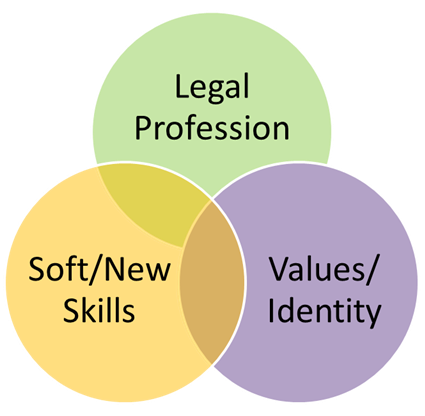 What is the role of “professional identity” in legal education and in lawyers’ development? Neil Hamilton & Verna Monson, Ethical Professional (Trans)formation: Themes from Interviews about Professionalism with Exemplary Lawyers, 52 Santa Clara L. Rev. 921 (2012). Can “competencies” be taught in law school or only after graduation? Are different “competencies” more readily taught versus learned in practice? What is meant by “emotional intelligence” and why might it be important? Consider an example: truth or lies? What are the changes that have affected the legal profession in recent years? What are the most important forces that are likely in the future to affect the development of the legal profession? What do law students and beginning lawyers need to do to prepare for change? How can technological changes help address gaps in access to justice? What excites (or scares me) about technology and law practice? What is document automation and why should I care about it? When does technology make a difference… for good or ill? Where does conflict come from? What is your conflict profile? 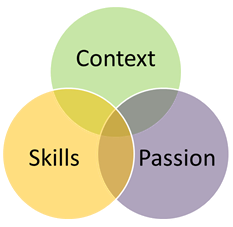 When and why are teams needed in professional contexts? What are characteristics of good teams, in your view? What leads to conflict within teams? What kinds of conduct can derail effective teamwork? How can individuals learn to deal with conflict in teams and other settings more effectively? Michael Wheeler, Dana Nelson, Nonverbal Communication in Negotiation (Harvard Business School, 2009) (please note that copyright costs for students were paid by instructor; you may download one copy but may not distribute to others). What was difficult about preparing a story board? How do you turn a story board into a “guided interview” with A2J? What kinds of written work and what types of oral presentations are expected of lawyers? What are the earmarks of effective written work and oral presentations? What impediments exist to effective written work and oral presentations? Why might professionals care about how effectively they work with others different from themselves? Andi Curcio, Teresa Ward, & Nisha Dograal, A Survey Instrument to Develop, Tailor, and Help Measure Law Student Cultural Diversity Education Learning Outcomes, 38 Nova L. Rev. 177 (2014). Exercise. Each team of students will assign advance reading and present on a subfield of possible professional practice or area of work that is of special interest to them. Student teams will have 10 minutes to present with five minutes for questions thereafter. For more details, see separate assignment sheet with exercise description and related tasks. How does HotDocs relate to A2J? What can I do if I’m stuck? Professionalism Course Syllabi by CALI is licensed under a Creative Commons Attribution-ShareAlike 4.0 International License, except where otherwise noted.